You are here: Home » Blog » Food & Drink » Sushi: It’s Not All Raw Fish Anymore! Sushi: It’s Not All Raw Fish Anymore! The word “sushi” brings forth visions of a wonderful meal for some people and a horrible one for others. It’s probably safe to say that most people in the second group haven’t even tasted raw fish, but the idea of it gives them the willies. Without forcing anyone to eat something they don’t want to taste, non-sushi diners should know that they are missing out on so many good flavors. Sushi is traditionally defined as a Japanese dish of vinegar-flavored rice in small balls or rolls, topped with raw fish, egg or a variety of vegetables. But that’s “traditional” sushi. Today it’s a whole new rice ball game. First of all, just about every sushi house these days will also have some cooked items available on their menus. Frequently, cooked options will be chicken or beef teriyaki, shrimp and vegetable tempura, miso soup, dumplings and more. So, go eat with you friends who like sushi; you’ll eat well, too. 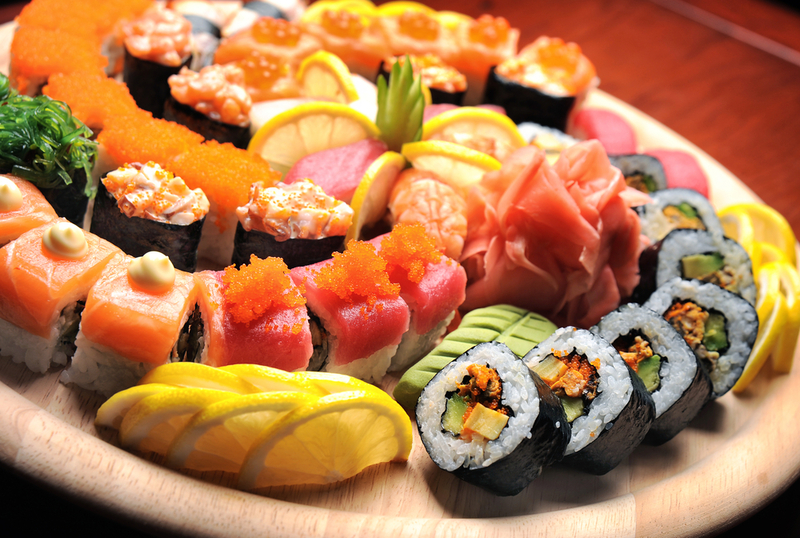 Next, menus frequently include sushi that is prepared with cooked seafood such as shrimp, scallops and eel. You may even find sushi rolls that are cooked tempura style (fried in a crispy light batter), a delight for any palate. Vegetarian sushi is also very common. It can contain avocados, mushrooms, onions, cucumber, carrots and more to create tasty meatless options. Vegans have also embraced sushi in their food renaissance with the opening of totally vegan sushi bars and restaurants in some larger cities. Talented chefs nationwide are creating new flavors and recreating old favorites without the use of animals or their by-products, making sushi a guilt-free dining experience.